Scientists at Lamont-Doherty Earth Observatory have designed a set of ice imaging instruments small enough to hitch a ride on planes flying over both poles on routine missions. 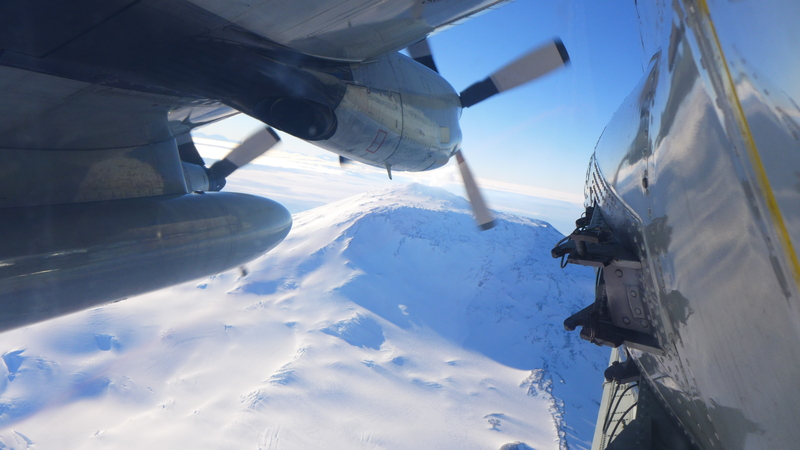 This spring, the IcePod will begin collecting data over Greenland from the wing of a New York Air National Guard LC130 plane. IcePod will help scientists to understand how quickly the ice sheets are changing as climate warms and what this will mean for global sea levels. Early winter in the Northern Hemisphere marks the start of austral summer in the Southern Hemisphere, and the beginning of the Antarctic field season. Each year, several thousand scientists head to the icy continent to take advantage of the relatively mild, though still very harsh, weather and the 24-hour daylight; the next time the sun will fall below the horizon at Antarctica’s McMurdo Station is February 20, 2015. 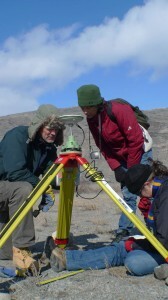 Lamont-Doherty Earth Observatory scientists are among the many researchers currently doing fieldwork in Antarctica. They’re leading and participating in expeditions near, above and on the continent, doing critical studies that will advance understanding of Antarctica’s land and sea processes. Lamont biogeochemist Sonya Dyhrman is aboard an icebreaking ship, the R/V Nathaniel B. Palmer, for one month. In that time she’ll slowly travel south from Punta Arenas, Chile to research sites located off the Western Antarctic Peninsula. Dhyrman, graduate student Harriet Alexander and the other cruise scientists are investigating polar food web dynamics, with a focus on the feeding and swimming behavior of krill, a small shrimp-like crustacean. During the research cruise, Dyhrman and Alexander will collect samples of water and phytoplankton from a number of different sites. Their goal is to understand the physiological ecology of phytoplankton, which form the base of the marine food web in the Southern Ocean, and are a major source of food for krill. 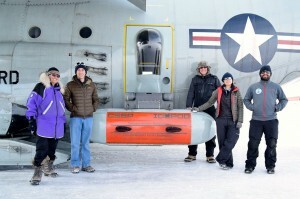 Lamont-Doherty scientists Robin Bell, Chris Bertinato, Nick Frearson, Winnie Chu and Tej Dhakal with IcePod. More than two thousand miles south, six scientists from Lamont’s Polar Geophysics Group are at McMurdo Station, a U.S. Antarctic research center located on Ross Island. 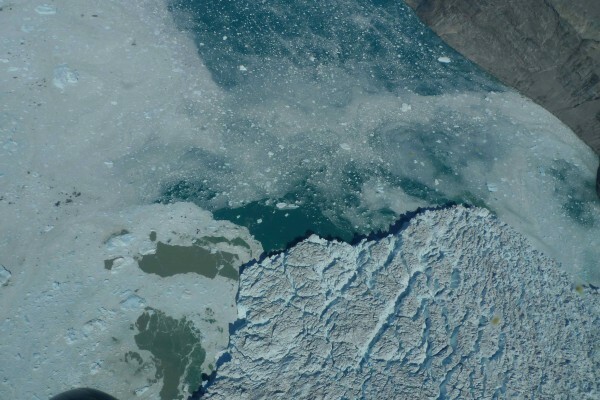 They’re deploying an ice imaging system, known as IcePod, which consists of ice-penetrating radar, infrared and visible cameras, a laser altimeter and other data-collection instruments. 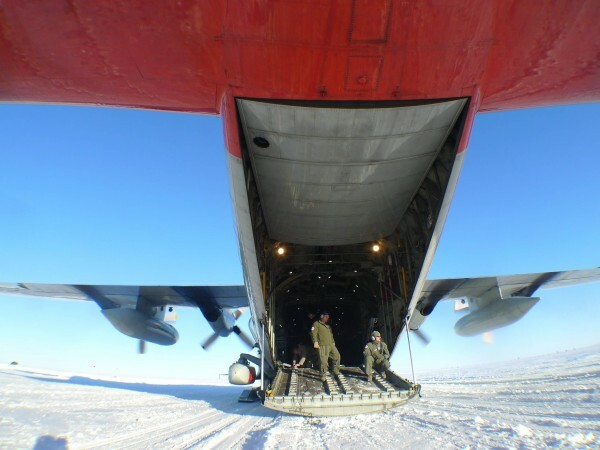 IcePod attaches to a New York Air National Guard LC-130 aircraft and measures, in detail, the ice surface and the ice bed; important data that enables the scientists to track changes in ice sheets and glaciers. The scientists are testing the instrumentation and training the New York Air National Guard in the deployment and operation of the instrument; this is the first time IcePod is being used in Antarctica. After the testing and training, IcePod will be operated in up to 15 other flights for routine data collection. Also at McMurdo Station are Lamont geologists Sidney Hemming and Trevor Williams. 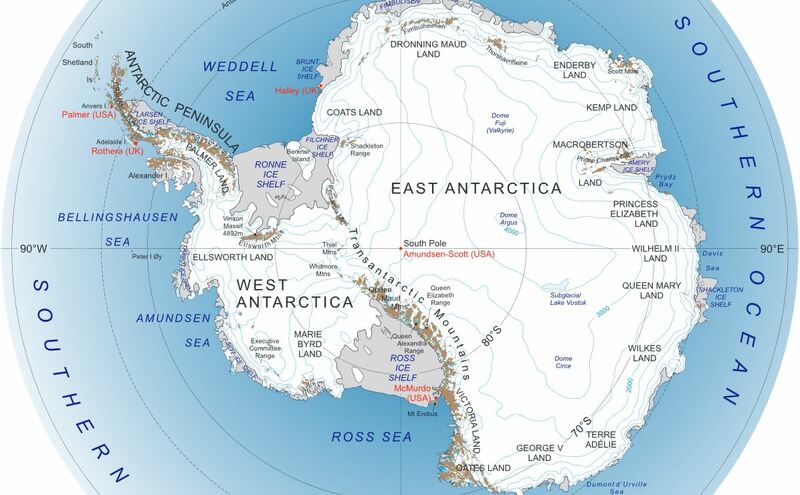 The two scientists and their colleagues Kathy Licht and Peter Braddock will soon fly to a field site in the remote Thomas Hills, near the Weddell Sea in the Atlantic sector of Antarctica. There they’ll spend four weeks making observations and collecting rock samples from the exposed tills on the edge of the massive Foundation Ice Stream, as well as from the Stephenson Bastion and Whichaway Nunataks. Lamont-Doherty’s Trevor Williams and Sidney Hemming (left), with colleagues Kathy Licht and Peter Braddock. The group is examining how ice sheets in the Weddell Sea embayment will respond to changing climate, specifically how Antarctic ice retreats and which parts of the ice sheet are most prone to retreat. Understanding the behavior of the Antarctic ice sheets and ice streams provides critical information about climate change and future sea level rise. 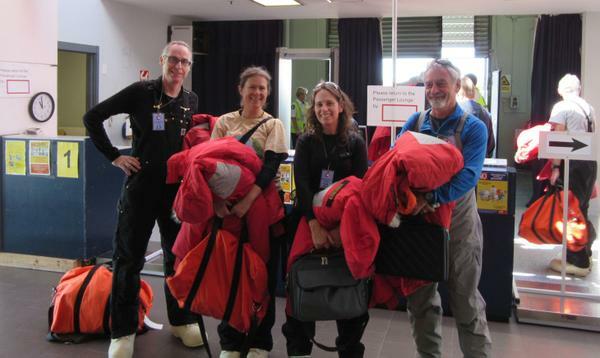 Thanks to the Internet and the scientists’ dedication to outreach, it’s possible to join their Antarctic expeditions without donning extreme cold weather gear. Follow the Dyhrman’s cruise activities on Twitter via @DyhrmanLab and #TeamDyhrman, and learn more about their research on the cruise website. The IcePod team is blogging about their fieldwork on State of the Planet, and updates from the Lamont geologists in the Thomas Hills can be found on Twitter via @Trevor_On_Ice and #AntarcticaG297. 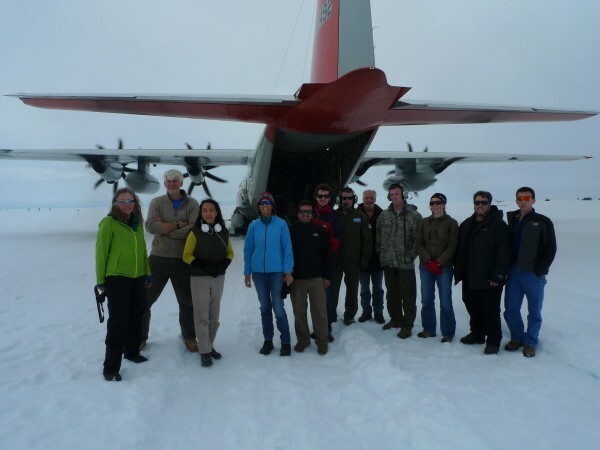 The first dedicated Antarctic Icepod mission was flown out across the center of the Ross Ice Shelf. Ice shelves are thick floating extensions of the ice sheet that form as the ice flows off the continent and into the surrounding ocean. These are critical ice features in Antarctica, bounding a full 44 percent of her coastline, where they serve as a buttress to slow the ice movement off the continent into the ocean. The goal of the six-and-a-half-hour mission was to test how the Icepod could image the varying processes at the base of the ice shelf and how well the gravimeter would work flying 90m/sec. The gravimeter is a new addition to the Icepod suite of instruments. Housed separately inside the plane, the gravimeter requires a very stable platform. The instrument will be critical for determining the water depth beneath the Ross Ice Shelf, the least explored piece of ocean floor on our planet. 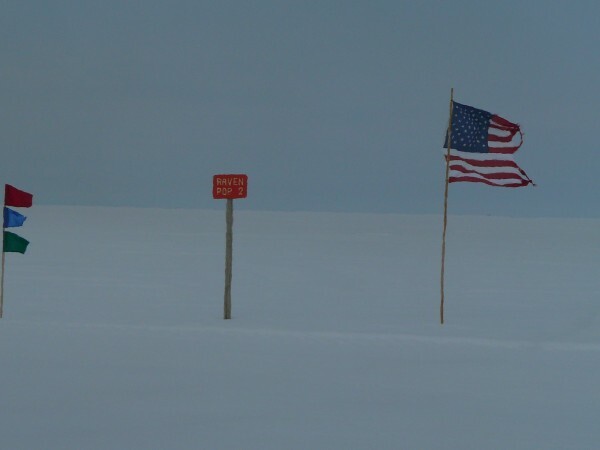 The plan was to cross the front of the ice shelf towards Roosevelt Island, then fly inland until the plane crossed the J9 site where the first hole through the ice shelf was drilled in the early 1970s as part of the Ross Ice Shelf Project (RISP). Icepod would then fly back toward McMurdo along a line where there are plans for another science project to drill next year. High resolution satellite image of Roosevelt Island in the Ross Ice Shelf, Antarctica. 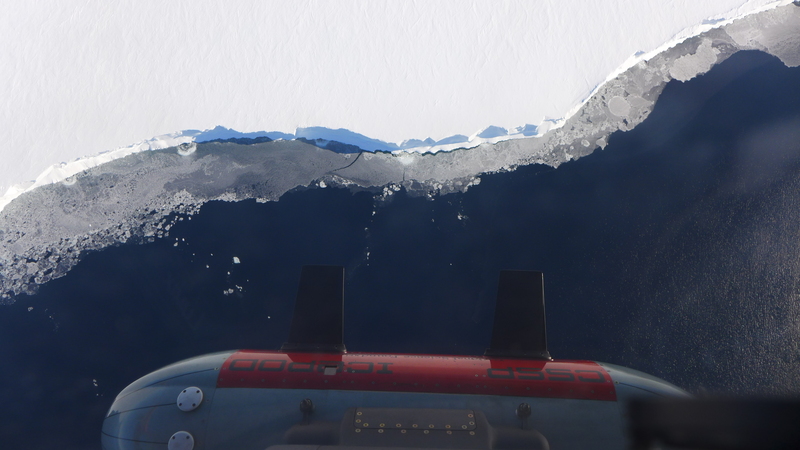 Floating ice appears flat and smooth like the ice in this image from NSIDC. The collected radar data showed remarkable variability over the ice. Crossing over Roosevelt Island, the change from floating shelf ice to marginal crevasses (deep cuts or openings in the ice) to ice sitting directly on the bedrock was imaged. The variation in the reflection from the bottom of the ice probably represented the different processes occurring at the ice sheet base. In some places there was evidence of ice being added to the bottom of the shelf. When the RISP team, which included Lamont’s Stan Jacobs, drilled through J9 in the 1970s, they found refrozen ice with a structure that resembled waffles. 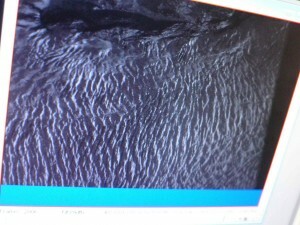 That team also captured pictures of fish beneath the ice shelf, demonstrating that the area below was not the wasteland that it was originally believed to be. 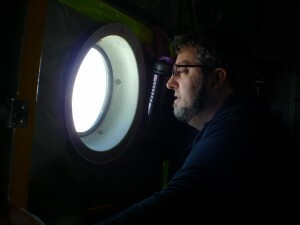 Icepod overflew the best fishing hole on the Ross Ice Shelf while the team looked at the pictures of the bright-eyed fish in the Science paper, and smiled. It is almost 50 years later, and while we have a much better understanding of Antarctica, there remains so much that is unexplored. 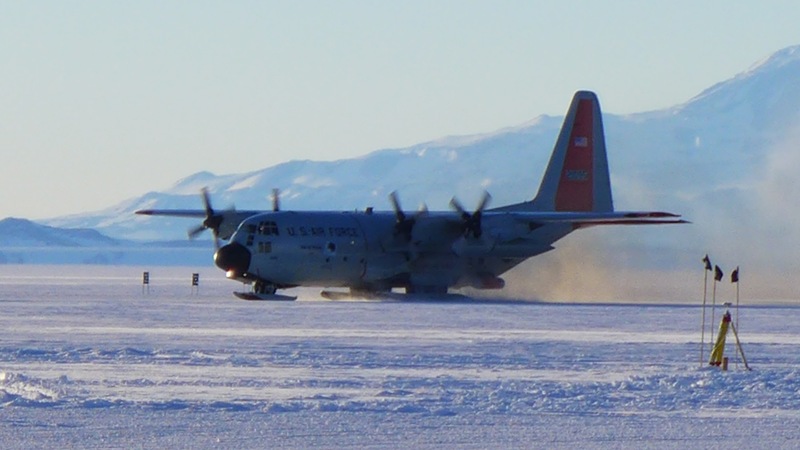 Icepod and the LC-130 returned to Willie Field and began immediately to plan for the next flight. Migrating south in the winter is a behavior that Antarctic scientists share with many species of birds, although the scientists fly just a bit further south. For the IcePod team, it was time to join the migration so they could test their equipment in the most challenging environment the Earth has to offer. After three “equipment shake down” trips to Greenland over the last two years, 20 hours of flight time have been set aside for flights in Antarctica, part of the final hurdle in the commissioning of the pod. 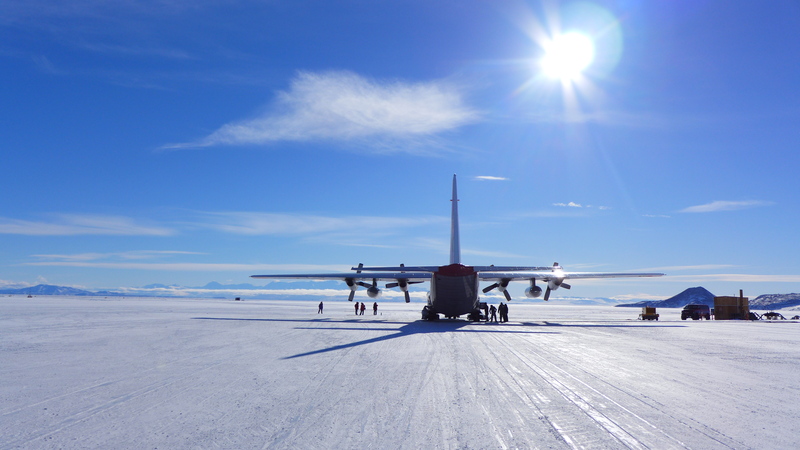 The team arrived early this month at McMurdo Base on a large C-17 to –14°F weather and beautiful clear blue sky as the plane touched down on the Pegasus Blue Ice Runway. The first few days were spent in training for everything from driving trucks in the cold to being environmentally sensitive to the Antarctic microbes to a crash course on interpreting the complex way trash is handled in Antarctica — an impressive 60 percent of everything is recycled. The gear arrived soon after the team… first the gravity meter, borrowed from New Zealand, wrapped in a warm, manly pinkish quilt. With many boxes being stacked in the aircraft, the color was selected for its high visibility to assist with quick location and unloading. The IcePod and the equipment rack had paused on their trip down in Pago Pago, arriving a few days after the rest of the gear, but it was all quickly set up and humming in a bright yellow and blue rack tent next to the Willy Airfield on the Ross Ice Shelf. 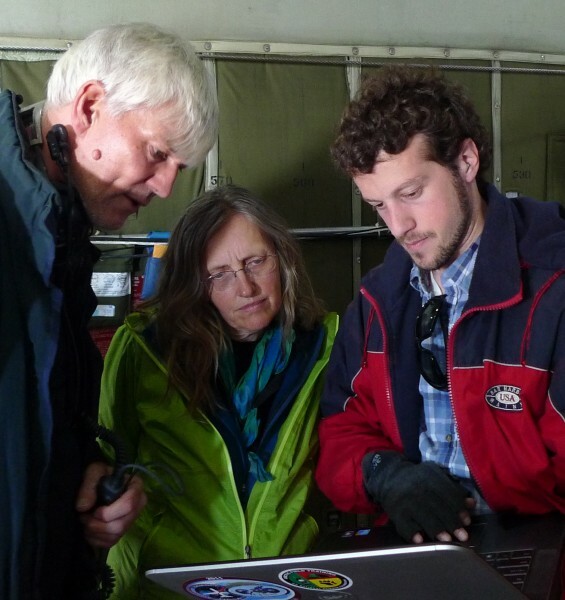 While waiting to fly, a GPS was installed on top of the tent, and equipment was set up to test performance. Both the GPS and the gravity meter measured the movement of the ice shelf as it shifted up and down on the tide ~ 1 meter a day. In addition to the rhythmic up/down movement, the tent, the airfield and the ice shelf are all moving northwards at 30 cm or 1 foot a day. 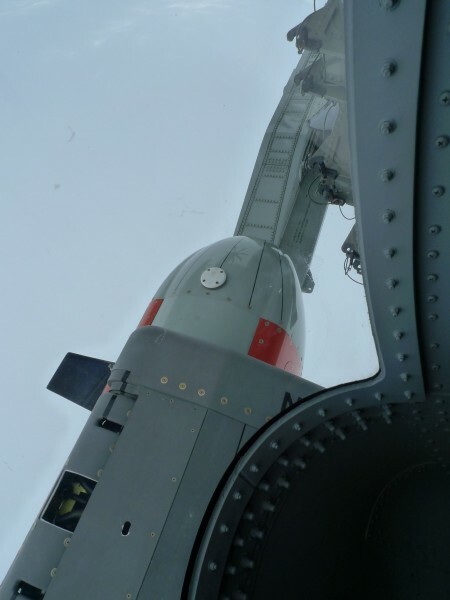 Finally, IcePod was cleared to fly and complete her first Antarctic survey mission installed on a Pole Tanker mission flying on Skier 95. 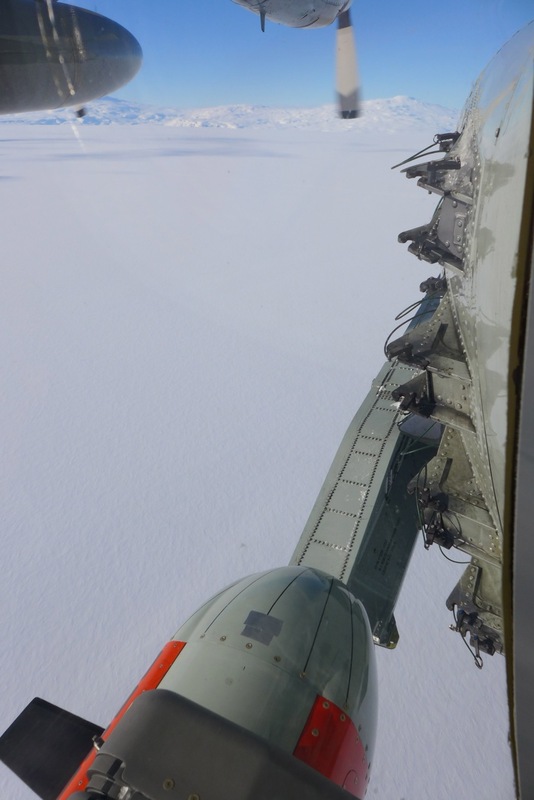 The flight was delayed as the C-17 practiced airdrops over the South Pole runway, but as soon as the C-17 was out of the way, icePod took off and headed south. Low elevation data was collected on the way out to make sure the C-17 was clear. 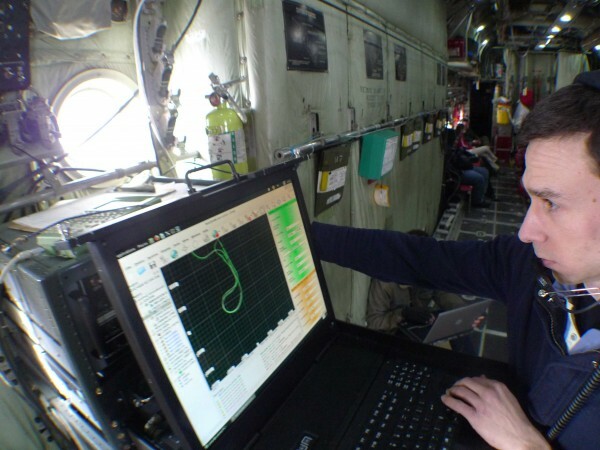 All the instruments worked in the flight across the very flat Ross Ice Shelf, then over the Transantarctic Mountains and across the spectacular East Antarctic Ice Sheet. The low angle of the sun made the mountains, crevasses and wind scour areas stand out beautifully in the imagery. 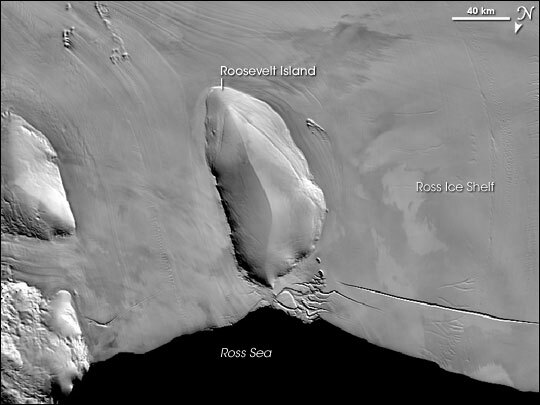 The deep radar imaged the structure of the Ross Ice Shelf even from 21,000 feet. The infra-red camera showed the variable temperature of the different types of ice in the Beardmore Glacier and the high plateau. The gravity meter that had rolled in on the speed pallet was extremely stable. 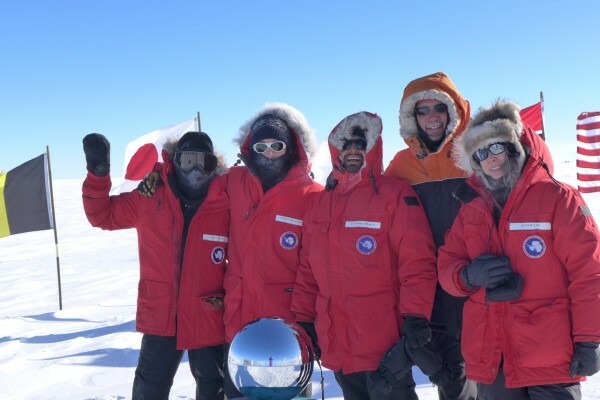 At the South Pole, Skier 95 offloaded fuel while the IcePod team made a quick trip to the actual pole. 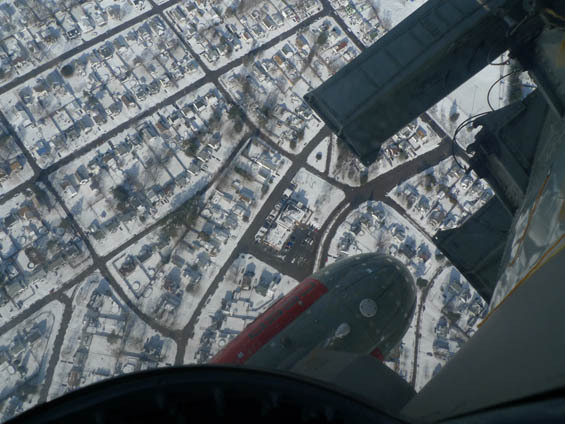 The flight was a success – data collected on an opportune flight and fuel delivered. Kanger sits nestled in the arm of Sondrestrom Fjord, where over the years Russell Glacier has found the soft belly in the rock base, wearing the surface down flat and pushing the rock flour out to sea. 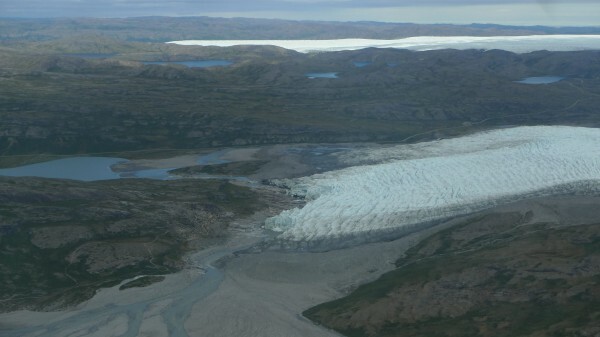 Currently the tip of Russell Glacier is a full 20 kms (14 mi) up the fjord. In the summer months, as research teams move through the village, glacial meltwater fills the carved channel that borders the small town. 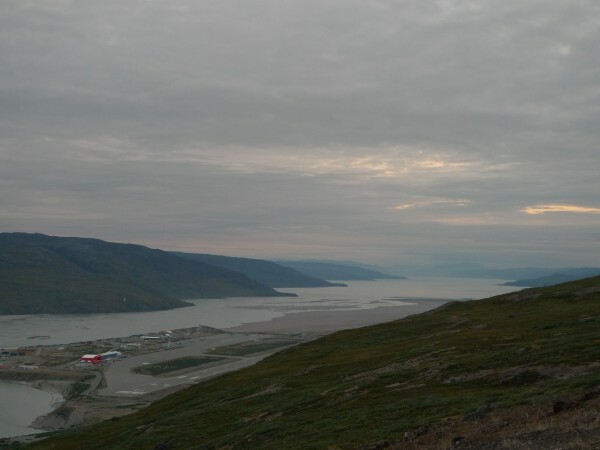 Although modest in size by our standards, Kangerlussuaq is a transportation hub for Greenland, and has a steady year-round population of ~500 residents. 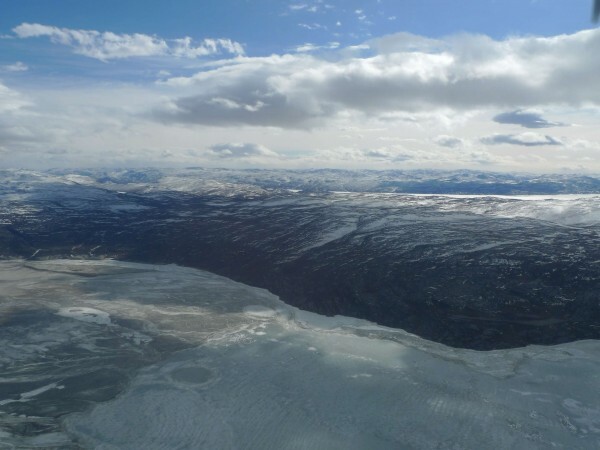 Today we fly to Raven Camp to complete a survey grid over the ice landing strip. 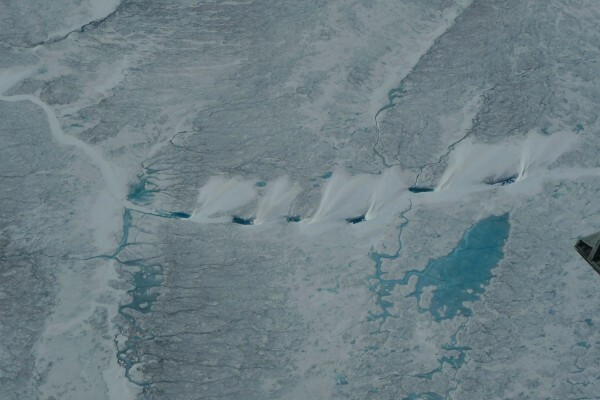 A year ago the camp staff detected several cracks (crevasses) in the ice running perpendicular to the airstrip. 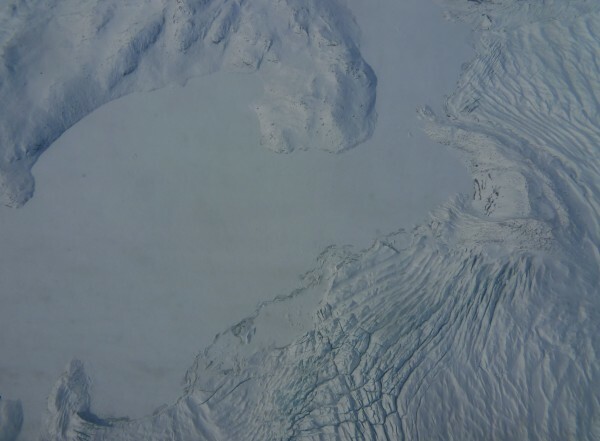 Crevasses are to be expected around the edges of an ice sheet, where the ice is faster flowing, however, at this elevation and this far inland it is more unusual. Published data for ice movement in this area shows at the base the ice is moving about 2.5 cm a day, while at the surface ice is moving closer to 7 cm a day. It is no surprise that the ice at the base moves more slowly, a result of the increased friction at the bed causing the ice to stick and slow. Currently measuring only 10 cms across, it certainly doesn’t seem that this could cause much trouble. But if the crevasses are deep and continue to widen, they will threaten the landing strip. 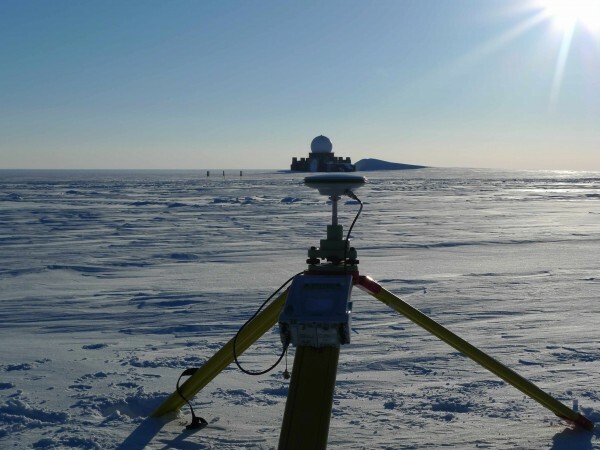 A team of scientists has been collecting measurements on the ground to see if these rates are changing (2013 polarfield blog1); our job is to survey the area with our instruments. 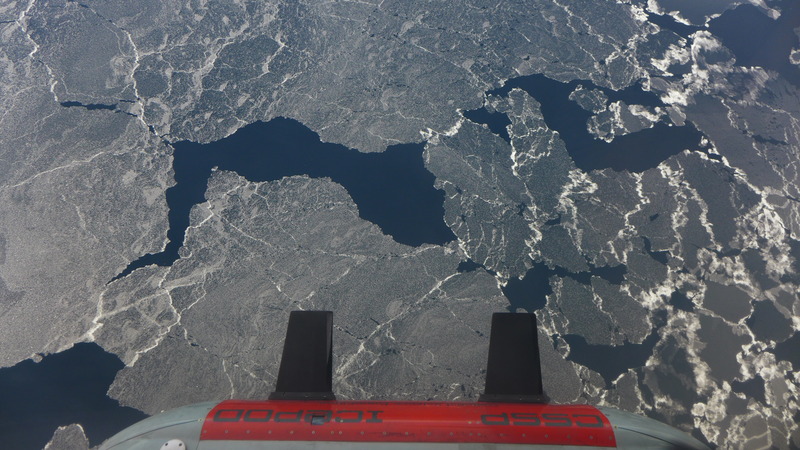 The Shallow Ice Radar and the infrared camera collect the depth of the cracks and the temperature differences as the cracks move deeper into the ice. Pulling all this data together will help us understand what is happening to the ice in this area. Our flight grid will be flown low, at 1,000 ft. above the ice surface, one third our normal survey elevation. Two East/West lines are flown perpendicular to the landing strip at 600 meters apart. Then three tie lines are flown parallel to the runway at 100 meters apart. 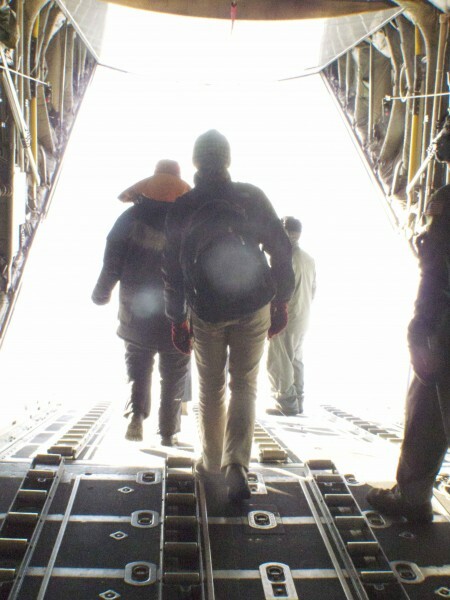 Once the grid is complete, we land on the airstrip, testing the seal on the pod door and collecting some camp cargo. The landing is smooth. Temperatures today at Raven are a warm 1°C. The snow has lost some of the crispness we had experienced when we had landed in April to install a GPS on the ice. The pod is inspected. 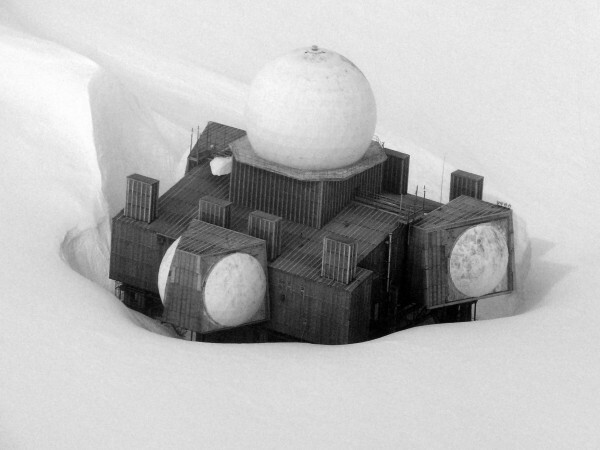 The camp looks all but abandoned, yet a snow vehicle appears with cargo that is stashed and secured for transit. While the cargo is loaded, we snap a quick IcePod team photo. The new eight-bladed propellers on Skier 92 do their job and the take-off is smooth for our return to Kangerlussuaq, just 144 miles, 30 minutes of transit, and yet seemingly worlds apart. 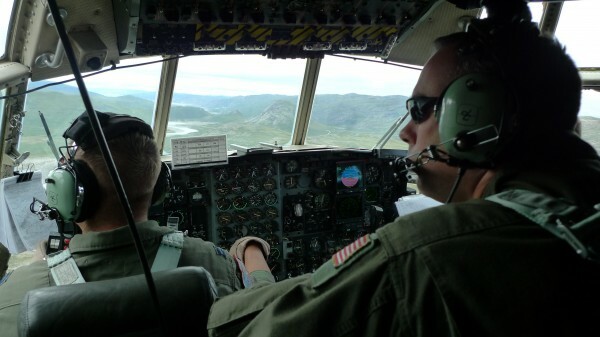 When the New York Air National Guard travels to Kangerlussuaq, they toss in a few fishing poles with the baggage for whatever few hours of free time might be available. A favored pastime for this location’s summer assignments means the local lakes are well known by the crew, so when we sat down to map out the flight plan, a request for locating lakes met with an easy nod. No problem at all. It took only seconds to register that our definition of lakes might differ from theirs. We are interested in lakes atop the ice sheet surface, places where the ice sheet melt is puddled into lakes of various sizes. 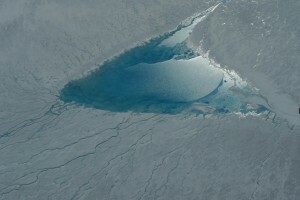 It is in locations like these lakes where water, with its darker color, absorbs more heat from the sun than the surrounding white ice surface. This process can contribute to more melt, and in some instances the water finds a weak “joint” in the ice and drains right down to the bottom. 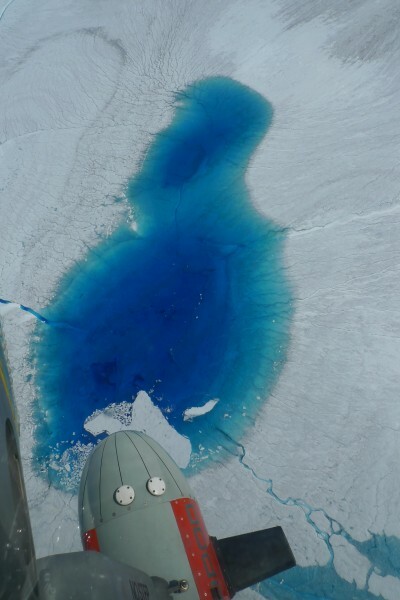 Both the extent of the ponding and this process are of interest to the science community in better understanding the ice sheet. The guard is quick to assure us, no problem, these too can be located! It was an “optics day,” where our focus is on the cameras in IcePod. Using both our Bobcat (visible wavelength) and our (IR) infrared cameras, we will image surface lakes and the meandering meltwater channels on the ice sheet surface, and then fly over a few of the southwest fjords to image meltwater as it plumes at the calving edge of the ice sheet. This is a day that Chris Zappa, our resident oceanographer and optics expert, has been waiting patiently for. The weather is perfect, the sky crystal clear, and the instruments are humming. We are ready to go. The surface of the ice sheet barely resembles our April visit. Large lakes, some a mile across, are printed along the ice sheet surface, as if a skipping stone has skimmed along the surface leaving pockets of water in its wake. These ice surface lakes are viewed more cautiously than our lakes back home, as they pose a threat of suddenly emptying through a “moulin” or drainage tube. Moulins transfer water from the surface to the bottom of the ice sheet in short order, circumventing a process that could otherwise take many thousands of years. Cutting across the surface in various patterns, meandering channels carry the melting surface water into these catchment pools. On the ice sheet these channels are the equivalent of streams from our home communities. Back home they collect runoff and drain into freshwater lakes. Here they serve the same function but are more striking, as there are no plants to screen them. The cameras work furiously. The Bobcat, is a 29-megapixel camera. The IR samples at 100 frames per second. Both cameras collect a staggering 60 gigabytes a second. Images play across the screen showing the temperature contrasts as we move over the surface features. 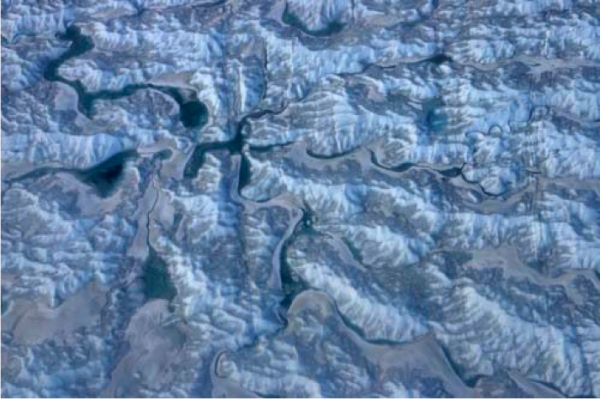 We move from the ice sheet to the coastline, where rugged mountains circle Greenland’s perimeter like a crown. Fjords cut through in many areas, allowing deeply stacked ice in the interior to move off the land. Today we are flying down small “arms” of Godthaab Fjord with a focus on their leading edges, where the ice meets the Atlantic water. We are interested in how the IR camera can be used to track thermal plumes at the interface of the cold glacier meltwater and the warmer ocean water. Combining both the Bobcat and the IR cameras allows sediment plumes to be tracked moving through the fjord. Sediment should warm faster than the surrounding water, and may be transferring more heat into the system. Both will tell us about circulation, mixing and transit of the glacial meltwater systems. Flying back down the fjord we pass over a small fishing town perched on the edge of the water. There is no apparent movement below. Perhaps they have gone fishing? I am surrounded by question posers, information seekers, hypothesis formers – scientists are an inquisitive bunch for sure – and that is how we find ourselves back in Greenland in July seeking to learn more about the information operating underneath and deep inside this changing ice sheet, and testing just what our IcePod instruments are capable of telling us. Thirty percent is well in excess of what we currently know about ice sheets and their processes, but every line flown and piece of data collected and analyzed builds upon our current understanding. Prior to arriving at the base for the morning, flight plans were laid well in advance. 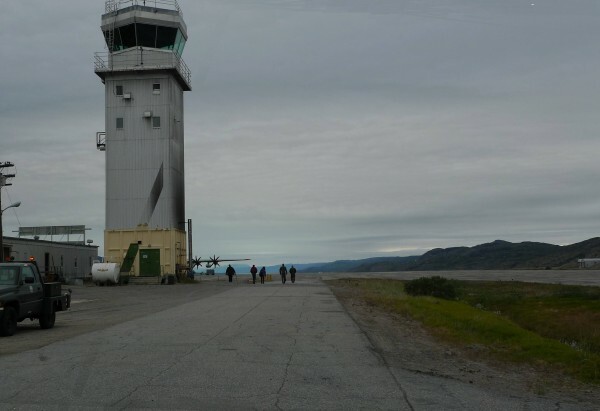 Discussions threaded through the series of meetings leading up to our return to Kangerlssuaq, piecing together the right combination of flights that would focus on testing instruments and addressing the science. Instrument range, elevation, seasonal snow conditions, old radar lines all are factored in. Once in Greenland we must weave weather and instrument issues into our planning. Weather is cloudy and reports suggest an improvement during the week, so we will shelve our camera testing for the minute and focus on instruments designed to penetrate through the clouds. Today our flight will focus on tuning our Deep Ice Radar System (DICE). Located at the crest of the ice sheet the elevation is just over 10,500 ft. and seems just the place to test our deep ice radar. Once aloft, we head for deep ice up over Summit. The weather reports are validated – the whole area is socked in with cloud cover and the pilots switch to Instrument Flight Rules (IFR). Our survey flight at Summit is 3,000 ft. above ground level (agl), but the aircraft instruments tell us we are 13,000 ft. above sea level (asl). The ice is deep and DICE is the focus of the next few hours as we survey and resurvey in the same area with dialogue, testing, refining and learning with each pass. A question was raised — would we want to move to a second area to look at different conditions? Checking other areas of the ice sheet is tempting, but the science team vetoes this…”We learn more by doing this now,” holding our focus on one location. So we refocused our efforts, collecting more data, making more small adjustments, and consider that with each data point we are improving our lipreading of the ice sheet. For more about IcePod: http://www.ldeo.columbia.edu/icepod. 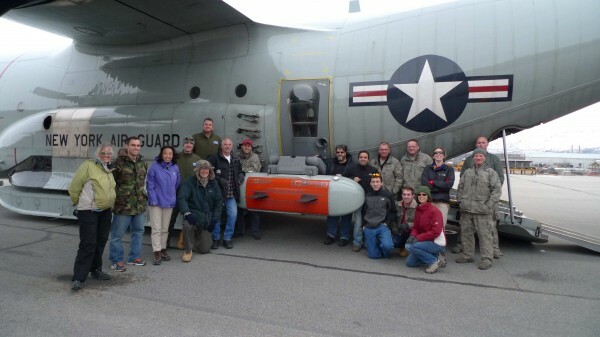 The Icepod team in Kangerlussuaq, Greenland including science, engineering and New York Air National Guard members. The Lamont IcePod team is a blended mix of engineers and scientists learning from each other through the design and testing of this new instrument. 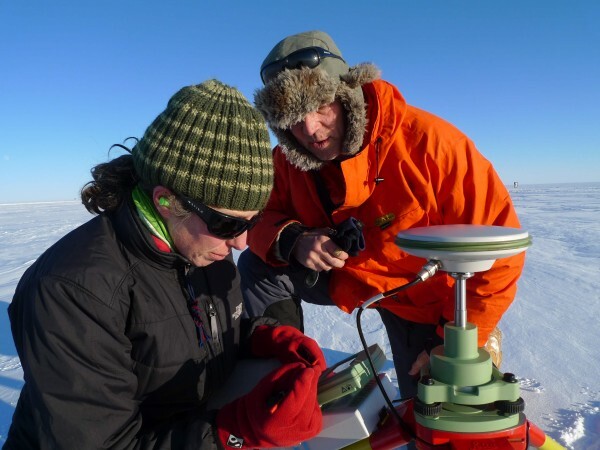 With a range of talents and backgrounds, the project mixes seasoned field workers with those new to field work; experienced instrument developers with those newly learning this end of engineering; and scientists with countless hours spent pouring over Greenland ice sheet data with those exploring the ice sheet for the first time. It is the opportunity for mentoring and development that comes from this mix of early career with experienced personnel that has made the IcePod Instrument Development Project a good fit for its American Recovery and Reinvestment Act funding. 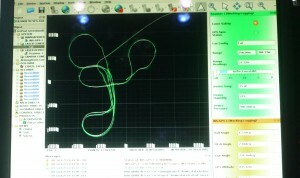 The Lidar track collected during the instrument calibration. The different colors represent changes in the reflectance which when matched to the GPS provide surface elevation. The small black “bites” in the track are where water blocks the return. The airstrip is the rectangular patch in the center. So who makes up the IcePod engineering and science team? As we work through data and examine the products collected in the first part of our field season there is an opportunity to introduce members of the team and the data and instruments they operate. 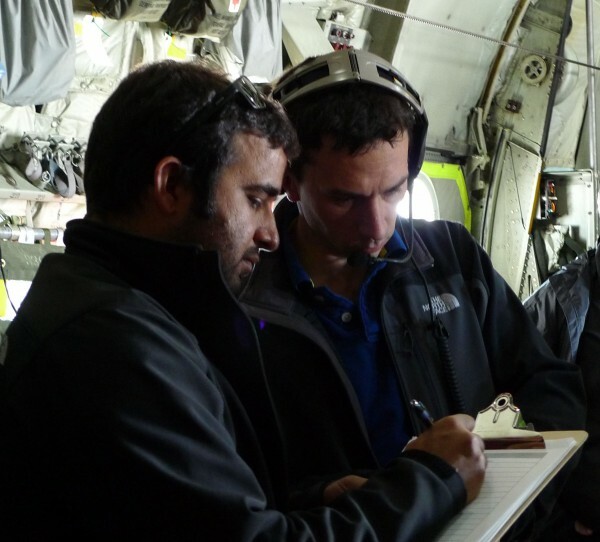 Chris Bertinato trained as an aerospace engineer before joining the IcePod team. In the air he is the team’s connection to the flight decisions made by the crew. Like the members of the flight crew he dons a headset as soon as aircraft begins its warm up. The headsets are connected into the plane electronics through lengthy cabling that trails behind each set. The cabling necessitates a threading and weaving between the crew as they move about the aircraft, testing and checking equipment and switches. Watching them work one can imagine a class devoted to practicing safe maneuvering about the plane while tethered to the electronics system – something like a Maypole dance! Chris is a main operator of the equipment rack and has responsibility for the Laser Imaging Detection And Ranging (LIDAR) system part of the optical package in the pod taking constant measurements to find the surface elevation, and the inertial navigation system (INS) used to locate or “georeference” the data. The INS is a critical navigation aid that employs several accelerometers (motion sensors) and gyroscopes (rotations sensors) to continuously calculate the position, orientation, direction and speed of the plane as it moves through space. 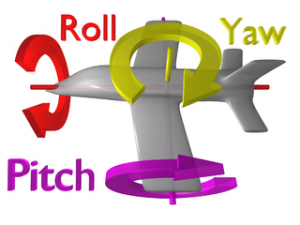 INS were first developed for rockets, but have become essential instruments for collecting referenced data in an aircraft, since the pitch, roll and yaw of the plane (see drawing) as it moves through the air can make it difficult to correctly locate and orient the data for processing. For those of us used to flying on commercial airliners, movies and music can provide enough of a distraction that we don’t notice the regular rolling of the aircraft as it responds to buffeting by the air around it. 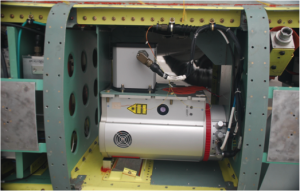 The cylindrical housing for the laser sits snugly in one of the pod bays with the INS sitting atop in the small grey box. The laser focuses down through a clear panel, and scans back and forth in a swath that at 3000 ft. of altitude swings approximately 3000 ft. wide collecting elevation information. 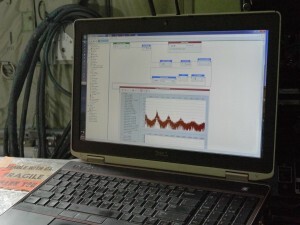 The data is then fed through a processor that turns it into elevation data. The image above shows a swath of laser data over the airbase, and can be used to help explain the instrument. 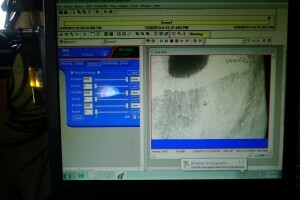 The color in the image shows the reflectance of different surfaces to the laser. You will see three of the LC130 aircraft lined up across the front of the airfield, cleaned from snow and clearly outlined in the data. 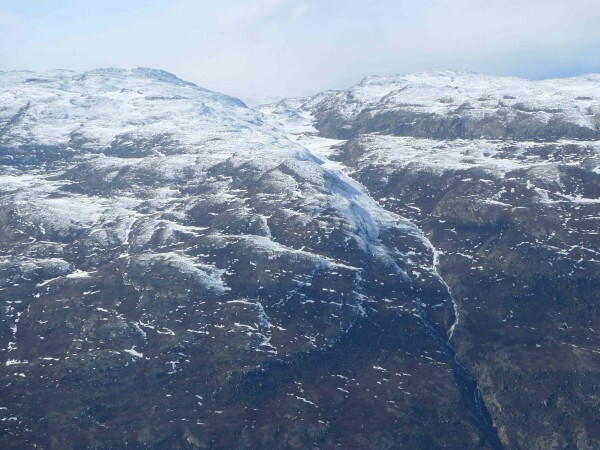 There are two additional aircraft positioned in the middle of the image that are still surrounded by snow and therefore remain somewhat obscured. Trees, roads and other features in the adjacent area are clearly imaged. 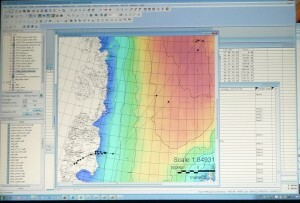 In Greenland Lidar will be used to assist with locating features of interest in the ice sheet. 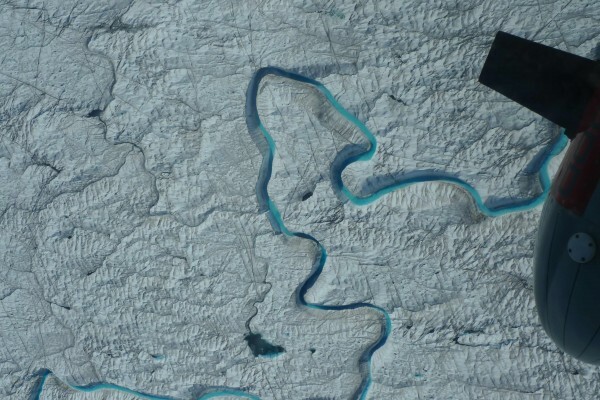 The image above of meltwater channels in Greenland will be important to track during the summer season as these channels can reactivate seasonally, becoming a blue stripe on the otherwise white landscape. These darkened blue sections will absorb more heat energy from the sun due to their altered reflectivity (albedo) encouraging additional surface melt. In an upcoming post we will discuss how the infrared camera carried in the pod will allow us to track the heat energy in the channel both in its current state, and as it begins to melt later in the season. Lidar will also be used to detect openings in the ice sheet (crevasses). Many of the crevasses are deep yet not wide, making them difficult to detect without the assistance of instruments. 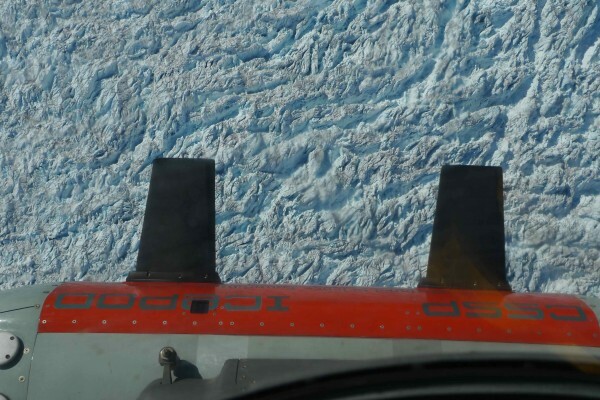 Detecting crevasses is important as they pose danger for pilots attempting to land and deliver support to ground crews, can be deadly for overland traverses that are carry scientists and support staff across the ice, and can provide us with critical information on changes in the ice sheet. Lidar data collected in our IcePod flights can be used to help in all of these situations. When we left Stratton Air Field almost two weeks ago, I recall smiling when a mechanical issue temporarily pulled us from the aircraft and the woman shepherding us back into the waiting area remarked, “Don’t worry, we keep doing it until we get it right!” Today we are faced with just that type of day. Testing a new system is all about running through the same set of operations “until you get it right.” For our team, this means flying the same patterns over the same locations looking for repeat targets to test and retest our instruments. The aircrew arrives each morning ready to fly the patterns and routes we have selected. They are willing to redirect if the weather changes, or if our priorities shift, but we have stayed fairly consistent in our requests. Of course, being in Greenland, we talk about varying our plan and picking some of our science team’s favorite targets. It seems almost unfair to be here and not venture off to the fast changing Jakobshavn or Petermann glaciers. But we are a disciplined group with a specific mission…we need to do it “until we get it right.” The navigator programs the plans into his system and we are ready to fly. We are lucky. 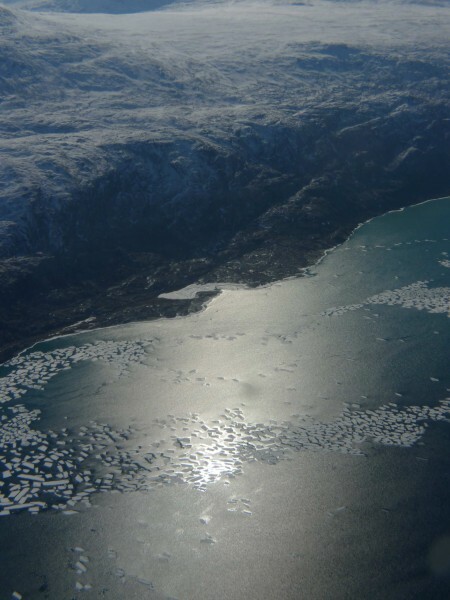 No matter how many times we fly over the Sondrestrom Fjord, it always looks stunning: the water a deep blue, the ice pieces feathered along the edge where the floating tongue ends. Once we move over the deeper ice in the center of the glacier, we still marvel at the twisting, refrozen meltwater streams that wind across the ice face. Over the rocky edges of the landmass it is still fascinating to see the twisting rolls of collapsing ice that pile and swirl along the brim of the flat-topped frozen lakes. The mountains themselves look like painted rocks with their smooth and shiny surfaces. Holidays vary around the world with their dates and traditions, so it should have come as no surprise that we would find a holiday in our scheduled Greenland visit. 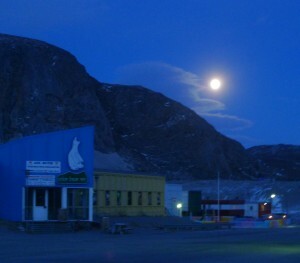 Today, April 26, is “Store Bededag,” which translates as “Great Prayer Day,” brought by the Danish to Greenland when they ventured to this island from their homeland. 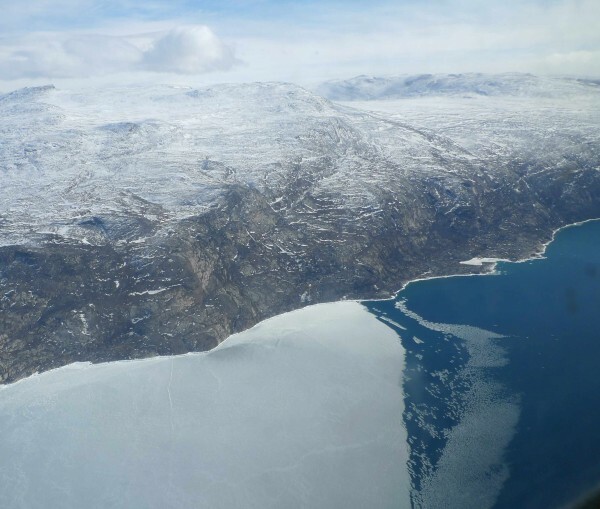 Kangerlussuaq, and other populated areas of Greenland, are a mix of Danish and Greenlandic in people, language, food and tradition. The holiday does not stop our survey flights today, but a snow storm with low-visibility has brought us to the ground. In the end it is a good day to focus on data. Prior to today we have completed several flights, each with a tightly designed purpose, and there is plenty of data to be gone through. With our newly designed system, each instrument must be tested individually for operational capability and range, and then assessed for the enhancement that comes from aligning the results with the data from the other instrumentation. Calibration runs are also required for some of the instruments. In the end, each flight ends with a stack of data disks which need to be reviewed in detail. Each flight has a list of priorities designed around specific target locations and weather availability. Yesterday our target instruments were the visible and infrared cameras, the laser system and the deep ice radar system. For the two cameras we would fly down Sondrestrom Fjord building a set of matching images. The Bobcat, our visible image camera, showed a wide swath of surface imagery, noting where fast moving ice had crumpled into bands of ridges, as well as where it had thinned, cracked, and showed evidence of refrozen melt water streams. The Infrared Camera operates at a higher frame capture than the Bobcat, and collects temperature differences from the places where the ice has thinned or opened. The colder the surface, the blacker the infrared image; warmer surfaces show as white. The tongue of the fjord is an excellent testing area for this. The Deep Ice Radar was being fine-tuned on this flight. 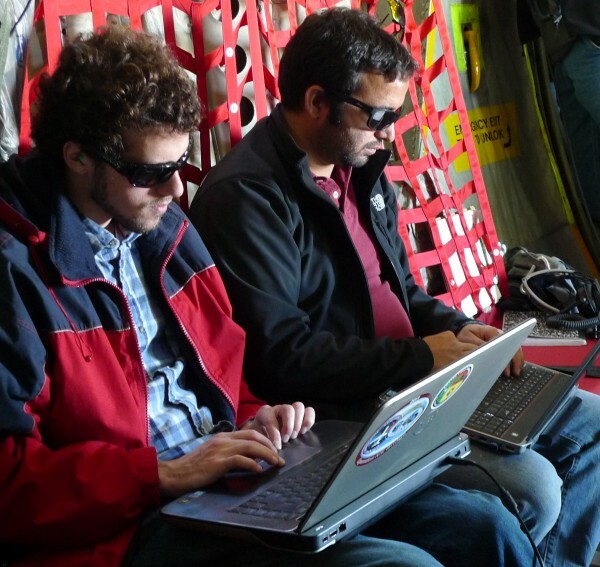 Following the first Greenland test flight, the system was adjusted and the team was anxious to see the results. We headed up Russell Glacier to get to enough ice depth to receive the radar returns, but with the weather worsening and the winds kicking up, we didn’t go any further than needed. The LIDAR (Laser Imaging Detection And Ranging) testing was our last test of the day. Designed to give us surface elevation, with repeat use it can show change in ice surface elevation over time. In order to show small change in ice elevation, a very tight accuracy is needed, on the order of 10 cms. 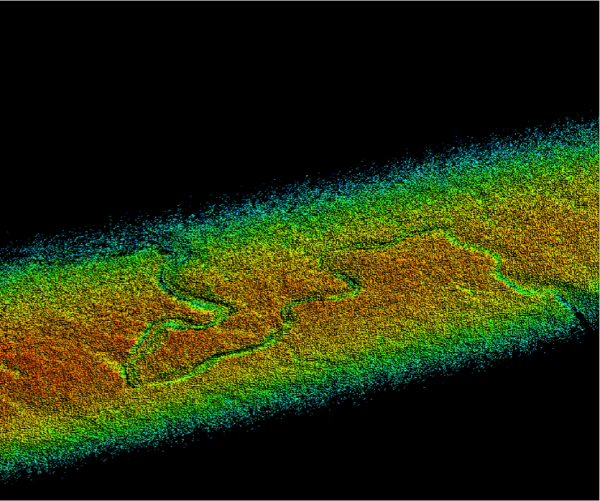 The LIDAR calibration was designed as a gridded pattern of 4 by 4 lines flown at 170 knots of air speed. Calibration flights can be bumpy and twisty, as the plane will roll with the turns needed to create the pattern. The 20-knot headwinds cause some additional turbulence, but the full eight passes are completed before a return to the airfield. Half of the people lining the walls of the Kangerlussuaq International Science Support (KISS) building are waiting to go north to the top of the ice sheet at Summit Camp, and the other half are waiting to go east to the top of the ice sheet at Raven Camp. The science and support teams have been ready and waiting for several days now, hoping for a break in the weather up on the ice sheet. For the Icepod team the waiting is just as difficult. A series of flight options have been drafted, but with the target of getting equipment and teams out to the camps, our flights are shifted for the moment to “piggybacks” with other flight missions. Piggybacks are actually an excellent opportunity for the project to show how the pod might work once the full system is tested and ready for science use. 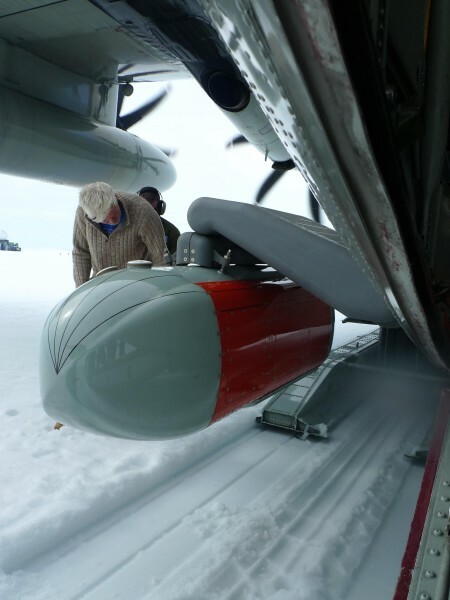 The project design is for the pod to be fully integrated into the guard’s NSF Operation Deep Freeze mission of supporting science in the polar-regions. In the future, as the LC130’s deliver cargo and personnel to the polar science camps, the pod can be switched on by the loadmaster to gather data as the aircraft transits. Word comes mid-morning that the first flight of carpenters and materials will head to Raven Camp. There is not room for us but we are set for the second flight. The runway at Raven Camp is a groomed strip on the ice sheet, so the pod will make its first ice landing. The first morning flight and ice landing go well for the pod, but one aircraft engine is causing some concern. The aircraft is looked over and the engine is cleared for us to take off late in the day with the second cargo delivery. 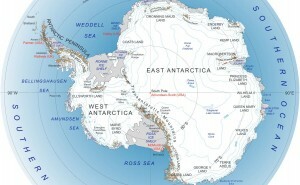 We will fly out at high altitude before we stop at camp to install a temporary GPS for an Icepod GPS calibration. A forklift is used to load two large pallets of cargo onto the metal tracks that run the length of the aircraft and that assist the quick release of the supplies. 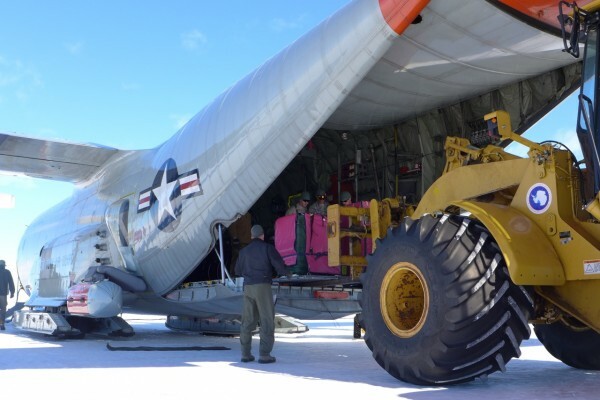 The delivery at Raven Camp will be a “combat offload” with the cargo unstrapped and the plane moving forward on the ice so that the load slides out the back.The pod team is loaded and ready to head out. 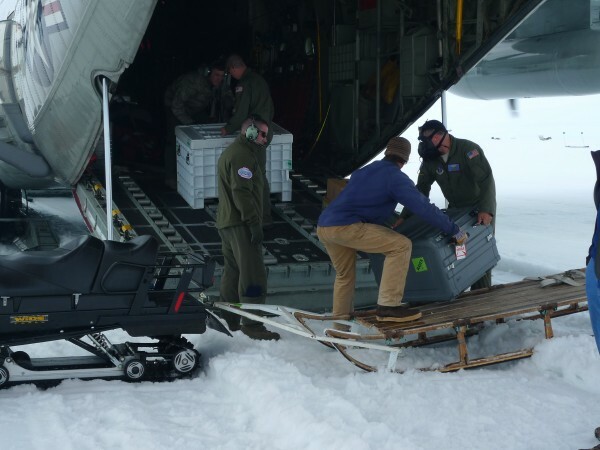 With the cargo delivered, several of us exit the aircraft to install a GPS base station on the ice sheet so that the pod can complete its GPS calibration. 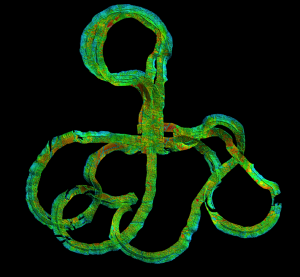 A cloverleaf design will be flown with 20 to 30 degree turns closing the loops and straight lines between, while the GPS tracks the changes in direction and the movement in the air. In the pod design an array of GPS’s were mounted, one on the aircraft hatch and several on the pod itself, in order to determine the best location for “seeing” the satellites and yet be close to the instruments. The GPS is critical to all the data, used to tie back to a specific point on Earth. 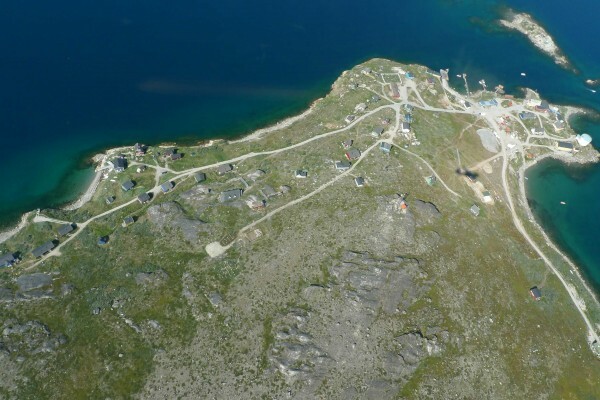 One station is set up back at Kangerlussuaq, and the second set up at Raven Camp will provide us a closure point so that we can tie together and adjust all the points in between. The station is set to operate. 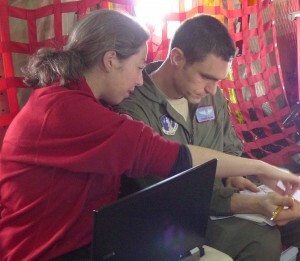 The team returns to the aircraft from the ice sheet and the calibration is flown. A follow-up flight to Raven Camp over the next few days will retrieve the GPS station. Once completed, the team heads for home over the ice sheet for a 9 p.m. touchdown. Although the aircraft loses an engine in the return transit, the day is determined a success with the completed piggyback flights, ice ramp landings and the GPS instrument calibration.